Chauffeured Limo Services for Every Occasion and All Events. When a couple or group of people call us to book a limo, they will receive the limousine of their choice for the day or evening and it includes a professional, polite and trained chauffer to make sure everything goes according to plan. A trained, professional chauffeured limo service for any and all occasions makes even the most stressful days more relaxed and easier on everyone. For a wedding, chauffeured limo services are an elegant way to bring any type of wedding together. Weddings are usually themed with colors or sometime with something that brought the couple together, this could be incorporated into the chauffeured limousine in colors. Traditionally, the chauffer will wear all black with a white shirt and black driving hat. Our limousines are driven by professional men with special licenses and training which includes many hours of experience. The chauffeurs check their directions to make sure they know where they are going for all events and use a GPS tracking system as a back up. We want to make sure your day or evening goes as planned and you and your guests arrive not only in style, but on time as well. Our chauffeurs are courteous and polite and will answer any questions people have but also know their place and will not interrupt conversations or talk unless asked to join a conversation. We understand that people are paying to have our drivers drive them and not talk the night away. A bachelor party group could request a female driver and a bachelorette party could request a male chauffeur. We want our customers to be happy and we will make every effort to schedule an individual on the day or night they are requested. If someone has used our services before and liked a certain driver, for example with our Lincoln Town Cars and airport services, we can arrange for the same driver for the next trip into town or pick up at the airport. Our chauffeurs know there place and will use the privacy screen or ask if a couple would like them to deploy the privacy screen before heading out for the evening. Many of our limos have intercom systems so when a chauffeur and passengers have arrived at their destination, they will call back to the riders and tell them they will be opening the back door in a moment. Having a chauffeured driven limo pick up a couple for a special night out on the town, having the limo driver open the door for them to enter and then exit the vehicle is a special treat. 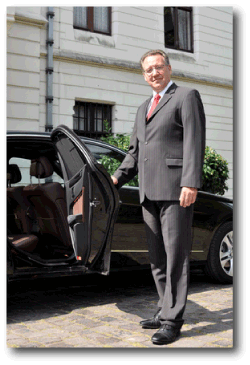 People say they feel like royalty when the chauffeur opens the door for them and this is what we want for our guests.